[SatNews] Worldwide, the Company broadcasts more than 1200 HD channels on its fleet of 50 satellites and reaches 258 million TV households. SES (Euronext Paris and Luxembourg Stock Exchange: SESG) announced today that satellite has become the leading TV infrastructure in Europe, ahead of terrestrial and cable reception. Approximately 84 million European households have satellite (Direct-to-Home, DTH) as their primary TV reception mode, an increase of 22 percent over the last four years. In the same period, terrestrial TV lost nearly 16 million homes, while cable lost over 2 million. IPTV—the TV distribution over tele-communication networks in IP format—has grown from a very low level to some 16 million households. These are the results of the year-end Satellite Monitor that SES presents annually and that is based on primary research in 35 European and North African countries. The study is based on more than 62,000 interviews, conducted by leading market research institutes under the lead of TNS Infratest, Germany. The main growth markets for satellite in 2011 were the UK, Germany, Ukraine, Poland and Italy. The main growth drivers are the development of digital reception and High Definition (HD). Satellite today is the leading digital infrastructure, reaching nearly 44 percent of all 186 million digital TV homes in Europe. The digitalization rate of satellite is 97 percent, compared to 70 percent in terrestrial reception and 48 percent in cable. The new study that SES presented today in London also shows that ASTRA is extending its position in the European markets. Around 142 million TV households are served by ASTRA, 7 million more than the year before and 25 million more than four years ago. 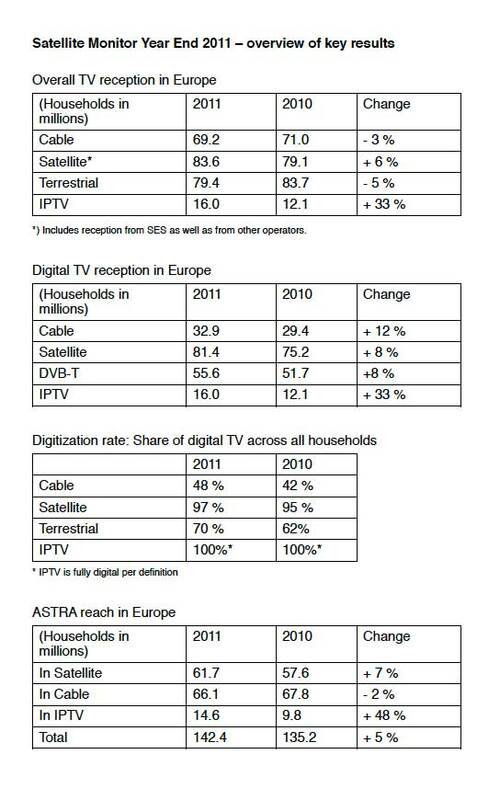 More than half of the European TV homes (57 percent) receive their signals from ASTRA. 73 percent of all European satellite homes are ASTRA households, a total of 62 million. As a leader of digitalization and High Definition (HD), ASTRA is also the leading HD platform in Europe. Over 23 million of the total 29 million satellite HD households in Europe are ASTRA households. The ASTRA Satellite System transmits 267 HD channels. Worldwide, SES broadcasts more than 1200 HD channels on its fleet of 50 satellites and reaches 258 million TV households. “This success confirms our view that satellite reception is the most attractive and future-proof mode for households to watch TV”, said Norbert Hölzle, Senior Vice President Commercial Europe, in London. 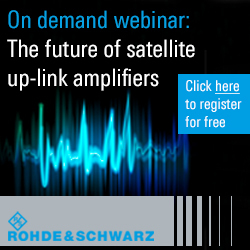 “The trend in Germany, where satellite overtook cable for the first time in history, is confirmed in the UK as well as in Europe overall, where satellite outgrew the other reception modes.